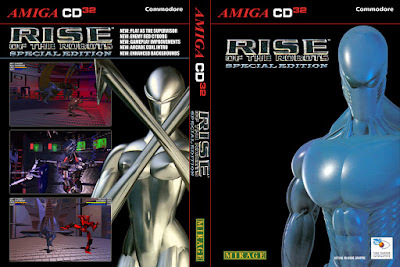 Rise of the Robots was one of the largest let downs in the gaming history - massively hyped and massively underwhelming. The Amiga version in particular was a disappointment, earning a scathing 5% from Amiga Power. Despite that, it has a surprising number of cult fans (myself included) and for them I present our "Special Edition" with numerous tweaks and fixes - several of them directly resolving issues that were raised in that review. Beginner-Medium difficulty fix: Blocked blows do no damage to either player. This resolves the issue where you can get through most of the game by holding UP+RIGHT+FIRE, and as a consequence makes the game much more challenging. Hard difficulty fix: Any non-blocked blow, regardless of how weak it is, does at least some damage. Mirror match: The red cyborg is now the first enemy you face. Once only: You don't need to face all regular opponents a second time before you face Supervisor. Supervisor: Now available in both training and two player modes. Military vs Military bout: The one and only way to fight without the Cyborg can be triggered from the main menu with the blue button. CDXL intro: An extended 3 minute intro scene featuring the attract sequence from the arcade version. New or adjusted backgrounds: Four of the seven backgrounds have been tweaked, or replaced entirely - including one adapted from the sequel.